Every literature lover would admit that simply having books in your personal library is a source of pride and joy. And, however, they love selflessly, by definition, each and every book, after a brief thought, they would be able to point to at least one volume that they cherish a little bit less – a hasty purchase, a poorly matched gift, a book they have outgrown or got bored with. A book unread loses its magical power. It should not be wasted! Want a piece of advice? Find a new owner for it! The Second Life of a Book is a undertaking of the Krakow Festival Office. Exchange participation rules are simple: it is enough to bring at least one, but no more than ten books. Important: the books must be in good condition. If you bring books published before 1995, you will be able to swap them only for other books published before 1995. People who bring new books (published after 1995) are allowed to select from all books, new and old alike. Last year’s second edition of the Second Life of a Book was record-breaking! 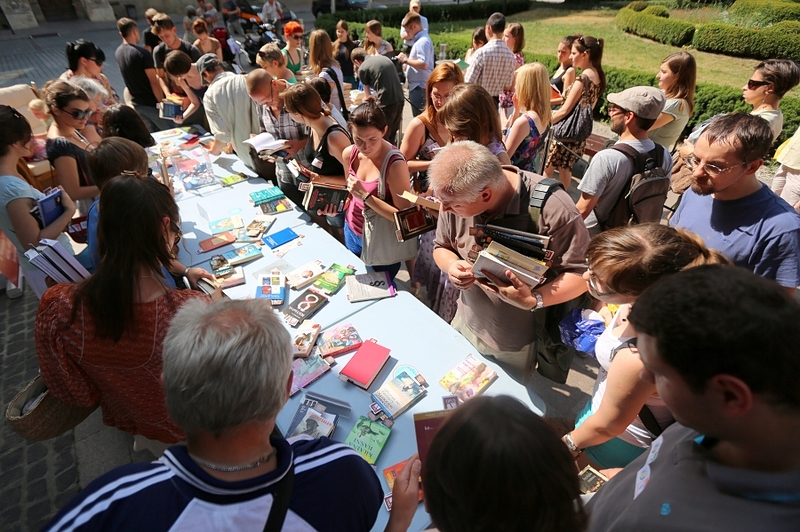 More than 10,000 people swapped their books, and nearly 20,000 books found their new owners. This year, following your request, we found a new, larger venue for our monthly book-swap – we shall meet at the Tourist Service Centre, 11 Powiśle Street. Special editions are also planned to be held during major literary events, e.g. the Conrad Festival or the Book Fair, as well as during popular events such as Najedzeni Fest! The Second Life of a Book is a part of a series of campaigns run by the Krakow Festival Office in order to promote a literary image of the city. The Krakow Festival Office organises two large literary festivals (an annual Conrad Festival and a biennial Czesław Miłosz Festival), eagerly contributes to initiatives of publishing houses which have their offices in Krakow, cooperates closely with the Book Fair – which is believed to be the most important event for the publishing industry; and supports all initiatives aimed at making the residents of Krakow and tourists familiar with literature. Apart from that, within the scope of Reading Małopolska programme, a series of advertising campaigns is planned, which will focus on the literary potential of the region. Within the past year alone, the Krakow Festival Office has organised also two large international conferences which drew the greatest figures of the literary world to Krakow, including representatives of UNESCO Cities of Literature, as well as members of PEN International and ICORN. In addition to that, an interactive multimedia Internet portal, readingmalopolska.pl, was created as a compendium of knowledge on literary attractions of the region. It is no accident that in Krakow, as the first city in Poland, Seats for Readers were marked on public transportation vehicles to celebrate the Miłosz Year.